Melodious, canopy-dwelling, and strikingly plumaged. Often heard in the spring in Eastern parks and backyards; or high in deciduous trees in open woodlands and edges. 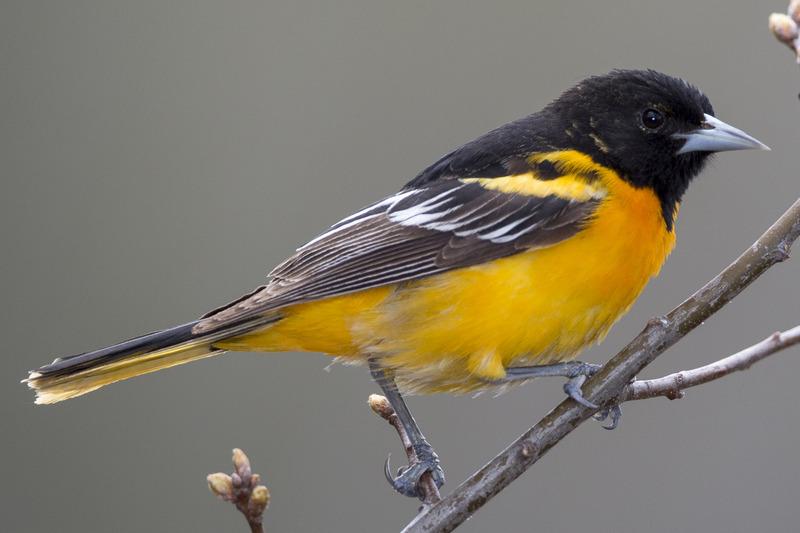 Medium-sized songbird, ranging from yellow-orange to a brilliant deep orange, with gray or black heads and backs, wing bars, and long curved bills. Acrobatic feeders that prefer fruit, flowers and insects; may be attracted to feeders with cut oranges and bananas. Sock-like hanging nest is woven over a period of week or two by the female, often in an American Elm, maple, or cottonwood tree. Lifespan up to 12 years. Population ~ 12 million and declining.